ATN Bangla is a Bangla language digital cable TV channel in Bangladesh.  ATN Bangla offers a wide variety of programs including news, movies, dramas, talk shows. Watch ATN Bangla online with high quality streaming at YuppTV.